That is until you start talking to NPCs, which is sometimes required to progress. The game uses a keyword-based dialogue system where you type in a word and if it's one the NPC recognizes, you'll get a few bits of lore, a quest, or some helpful advice. However, for whatever reason I could never figure out which words to use and this just made the whole experience frustrating. Thankfully, you can usually get around the keyword problem by casting Charm and Mindread on an NPC, so if you find yourself in a similar boat, don't be afraid to use these spells. Another thing to note here is that the game's Steam page advertises up to 600 hours of gameplay. In practice, while not going for a 100% playthrough and skipping areas here and there, it took me about 90 hours to beat Grimoire and get a couple of different endings. And as far as I'm concerned, that's more than respectable. 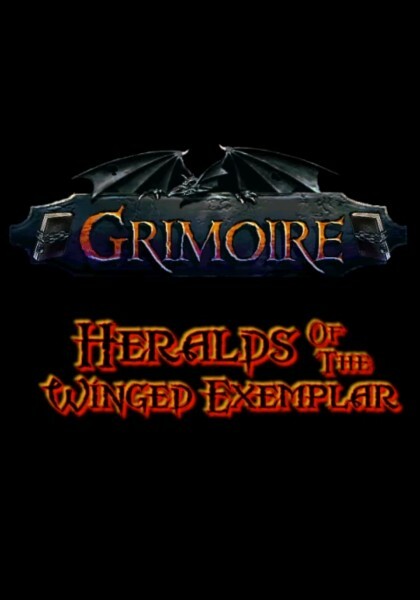 Grimoire took more than 20 years to make, and from the looks of it, the visuals were decided upon and set in stone pretty early. As a result, the game's environments don't look all that impressive in this day and age. And while I'm usually a sucker for these rich and colorful early to mid-1990s visuals, the bigger issue here is that Grimoire's tile set variety is quite pitiful. There's a forest, a dungeon, a town, a cave, a temple, and that's mostly it. The props you can stumble upon on your journey are quite limited too. So what usually happens is that upon entering a new location or inspecting a piece of scenery you'll get this awe-inspiring text description talking about grand vistas and amazing statues, but on your screen you'll see the same wall texture or the same pot you've already seen who knows how many times. As a result, you'll need to use your imagination if you want to appreciate what's happening in the game. But then, you'll need to put it into overdrive, because from the looks of it, thanks to the game's overly long development cycle, there doesn't seem to be any unifying theme in its enemy and NPC models, and some of them don't fit the overall visual style at all. The music seems to avoid this pitfall and can be described as alright to good. And while I wish I could say the same about Grimoire's general audio design, I can't. The game's sound effects range from bland to absolutely atrocious. The latter mostly involve monsters that assault your ears with obnoxiously loud, infinitely repeating noises whenever they appear on screen. I have no idea what possessed Cleve to put those into the game, but thankfully there's a separate slider in the settings menu that allows you to turn those noises way down or disable them altogether. The game's UI design isn't that great either. The text is limited to a small window on the bottom of the screen, item identification happens in an even tinier window, the mouse wheel doesn't seem to do anything, and the inventory is pretty clunky to sort and navigate. On top of it, how you use items sometimes defies any logic. Some of them, you click on the Use button then on the item. Others, you do the other way around and drag the item onto the button. And on a few occasions, you have to pick an item up and use it as your cursor when moving forward. If you ask me, it really didn't need to be this complicated. With how fun actually playing the game is, it's really a shame that Cleve didn't have a competent team and a decent budget. A few good artists, a UI designer, a writer to tighten some of the story bits, and we could be looking at one of the all time greats. As it stands, Grimoire's presentation can be the biggest hurdle for anyone who considers picking it up. Fortunately, Grimoire runs exactly how you'd expect a game from 20 years ago to run. It saves and loads almost instantly, and you can save at will. Just keep in mind that there are no autosaves, so remember the old mantra and save often and in different slots. The game isn't too prone to breaking, but it did crash on me a few times. Thankfully, you can report such bugs through Steam and they'll usually be sorted out in a timely fashion. Other than that, I encountered a few minor bugs with inventory management and spotted several typos. Another thing worth mentioning is the fact that you can't rebind keys, you can only see what they do by pressing F1. The game's resolution options are also quite limited and half of them doesn't seem to work.